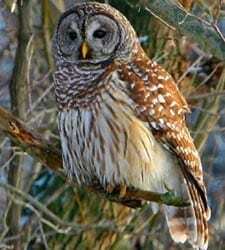 The Barred Owl’s hooting call, “Who cooks for you? Who cooks for you-all?” is a classic sound of old forests and treed swamps. But this attractive owl, with soulful brown eyes and brown-and-white-striped plumage, can also pass completely unnoticed as it flies noiselessly through the dense canopy or snoozes on a tree limb. Originally a bird of the east, during the twentieth century it spread through the Pacific Northwest and southward into California.